This past week at High Point Market, Alex had the pleasure of visiting the Lee Industries factory for a mini "Lee Academy". Here she got an inside look at the hard work and dedication that makes Lee the fantastic company it is. Some of you may already be familiar with the following information, but for those of you who aren't, please read on! In addition to being family owned and operated, their furniture is manufactured from start to finish in North Carolina, and 98% percent of the components in their products are from domestic suppliers (in fact, most come from within the state). Talk about local love! 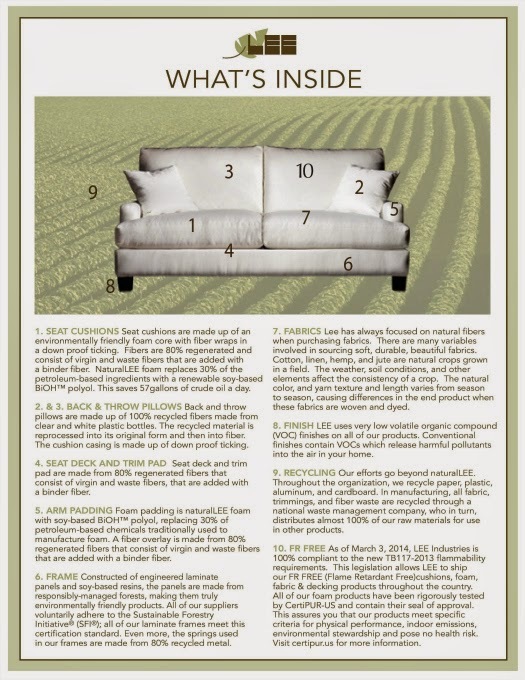 Another aspect of Lee Industries that make them such a compelling company is their steadfast determination to produce earth-friendly upholstery. There are many aspects of furniture production that have become increasingly toxic to both our health and that of the environment. Below is an info-graphic outlining some of the ways that Lee goes the extra mile to eliminate harmful toxins and reduce waste. Of course this is only the tip of the iceberg and we encourage you to discover more about Lee by visiting the Lee Industries website. Here are some shots from inside the factory! The C.O.M. (Customer's Own Material) Department. You wouldn't believe the precision involved in this process. Plant manager Darryl displaying the quality solid wood frame that is an integral part of every piece of Lee furniture. Hides on hides on hides! More leather as far as the eye can see. Thanks for the great tour of the leather plant, Trent! Now that you know more about Lee Industries, don't miss your chance to receive 30% off of your order for ONE MORE WEEK. Sale ends Oct 31st.